"A delicious soup served anytime." It was ok. I spiced it up with cayenne & it still didn't do much for me. Very yummy soup!...and easy to make too! I doubled the potatoes and omitted the potato flakes. Blending only half the soup adds texture and bits of vegetable for a hearty meal. I made this soup with vegetable broth instead of chicken broth (we had a vegetarian visitor) and it was fabulous, either hot or cold! I will definitely make this one again! Very good! I left out the potato flakes, soy saue, dill weed, rosemary, and white pepper. I used black pepper, salt, and a bit more basil instead. 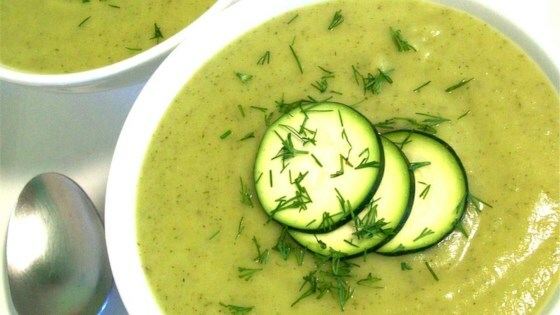 Very delicious and flavorful soup! great, easy and quick way to use up all those thousands of zucchinis that come this time of year... and it's good hot or cold.